To kick off 2014, the Amtrak History Blog will include a new monthly feature where we’ll take a closer look at an object in the Archives, particularly recently added items. It gives us a chance to really focus on the variety of material in our collections, which includes photographs, route guides, congressional legislation, buttons, china and more—basically, a little bit of everything! Some of the objects we collect, generally what’s termed “ephemera,” were never meant to be saved. This includes items such as tickets stubs, swizzle sticks, paper drinking cups and stickers. The word comes to us from the Greek “ephemeros,” meaning “lasting only one day.” With the advent of mechanized printing during the Industrial Revolution, ephemera as we know it came into existence, referring to a wide assortment of inexpensive printed items such as advertisements and broadsides that were intended to be used and then discarded. In time, though, some people kept these things as souvenirs, admiring their artwork, messages and other features. Distinct from high culture items such as finely bound books, etchings and the like, ephemera helps tell the story of day-to-day life. For Amtrak, commissioned photographs, annual reports and memos provide an official history of the company, but ephemera fills in the details that make for a richer, more textured portrait of America’s Railroad. One unusual piece of ephemera in the Archives is a paper cocktail napkin—definitely meant to be thrown away. At first glance, its line drawing of a glamorous couple—him wearing a dapper chapeau and her swathed in luxurious furs, with a perfectly coiffed poodle at their side—appears to advertise the renowned Twentieth Century Limited. Operated by the New York Central Railroad, this famous train ran between New York and Chicago, but was discontinued a few years prior to the start of Amtrak service in 1971. In fact, the napkin was created as part of an Amtrak marketing campaign that tied into the Tony award-winning musical On The Twentieth Century, whose action takes place on that fabled train. Lyrics hinted at the pleasant social atmosphere found on a train, which to this day encourages strangers to bond over fine meals and long conversations. Working with the show’s backers, Amtrak held a “Twentieth Century Week” aboard the Lake Shore Limited (New York/Boston-Chicago) in late 1978. Amtrak initiated the train three years earlier, and the tie-in to the musical and its railroad theme was a great way to bring attention to the service. In addition, the new train followed the Twentieth Century Limited ’s old “Water-Level” route through upstate New York and along the southern edge of Lake Erie. 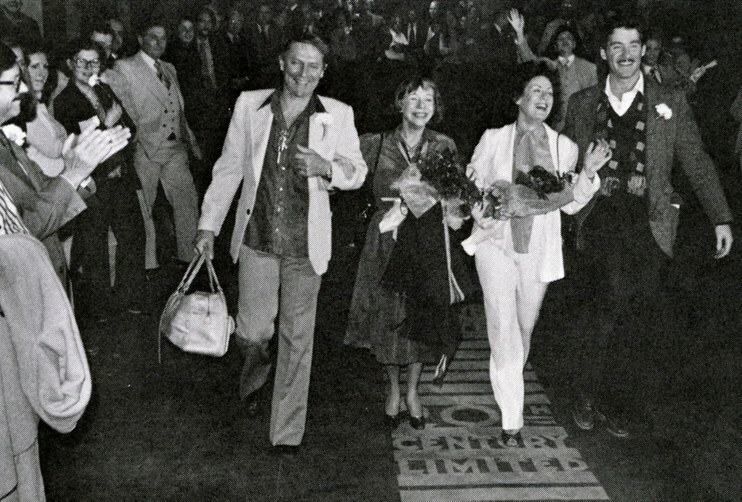 From left to right, John Cullum, Imogene Coca, Judy Kaye and Kevin Kline arrive at Grand Central Terminal to kick-off "Twentieth Century Week." The show’s stars, including Kevin Kline and Judy Kaye, gathered at Grand Central Terminal to kick-off the celebration, and actress Imogene Coca christened the train’s round-end observation car, added specially for the occasion, with a bottle of champagne. Trips were filled with special touches such as a glass of champagne at dinner, discount theater tickets for Amtrak passengers and this napkin emblazoned with an image from the show’s colorful poster. Lounge cars were also decorated with pictures from the show. The 1978 Annual Report noted that the brief tie-in increased business on the Lake Shore Limited by $50,000. 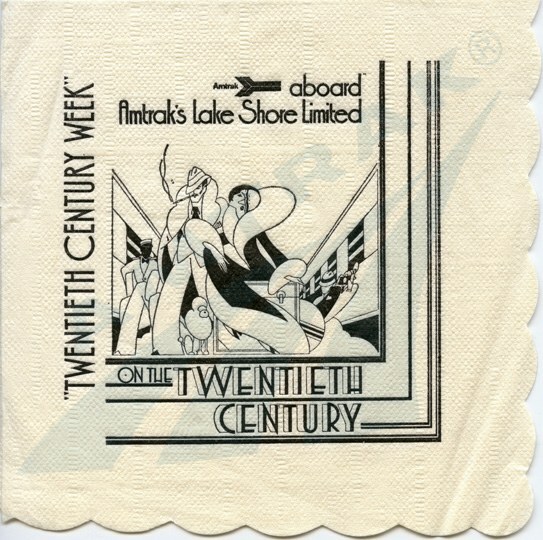 Did you ride the Lake Shore Limited during "Twentieth Century Week"? Share your memories with us! National Railroad Passenger Corporation, “Twentieth Century Limited Lives Again In Week-Long Lake Shore Promotion,” Amtrak NEWS, October, 1978, 4-5.